Did Somebody Slip a HANGOVER in your Drink??? • Hangovers are a big deal! It just shows the extent of alcohol poisoning. It rocks the central nervous system and also tinkers the brain with chemicals causing headache, dehydration, queasy stomach and weakened immune system. • Ladies, be aware of those free booze offered on Ladies' Night! You are more likely to be slammed when compared to men. Research says men have higher percentage of water in the body which dilutes the alcohol whereas in women, alcohol builds up in the blood stream. • Binge drinking speeds your way to hangover and having a non alcoholic drink or water between hard drinks not only keeps you hydrated but also makes you consume less alcohol. • Wine is not the gentlest choice if you wanna stay away from a hangover as red wines are rich in tannins that cause headache. Clear liquors are gentle choice to wake up fresh the next morning. • Diet cocktails cannot avoid hangovers! Studies suggest fruit juices can decrease the intensity of hangover. • The amount of alcohol that you consume matters the most and not the order of your drinks! Don't be fooled by the size of the drink. • Eating carbs after you are already drunk is no use. Any food can slow down the absorption of alcohol. Eat before the HappyHour and drink lots of water before going to bed to fight dehydration! • Alcohol helps you sleep well is a myth! 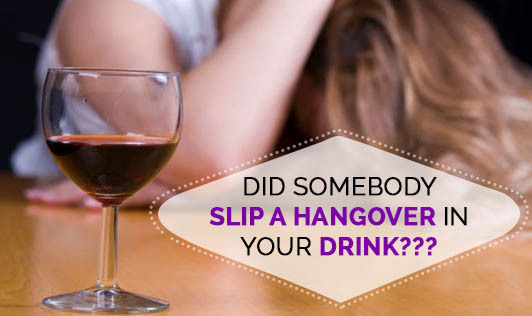 A hangover disrupts your sleep by leaving you uncomfortable to get back to sleep. • A bed coffee is not the cure for a previous night's hangover. Coffee, rich in caffeine increases dehydration and could make your hangover worse! Choose a sport drink or plain water instead. • Best way to prevent hangover is not to stay drunk! A wake up cocktail is not the cure. It just postpones a hangover and shows you are probably addicted to alcohol. • Alcohol poisoning is a medical emergency and not a myth! Confusion, vomiting, seizures, low body temperature, slow irregular breathing, passing out after drinking is the price of partying hard. These are the symptoms of severe dehydration or brain damage. Do not ignore!